Archangel Raphael can help you reduce or eliminate pain stemming from short-term and chronic conditions. Archangel Raphael often works with Archangel Michael to clear away fear and stress. It is recommended for healing, pain relief, stress and meditation. Archangel Raphael is the angel of healing, science and knowledge. If Archangel Raphael has come to you this indicates that you are a natural healer. Friends come to you with their problems, as they consciously or otherwise recognise your natural healing energy. If there is someone around you who needs healing of the body mind or spirit, Archangel Raphael will assist you in helping him or her and surround them with beautiful healing light. Archangel Raphael may also help with a relationship, a difficult situation or health problem concerning you or a loved one so you can be reassured it will soon be healed. Archangel Raphael assists with all forms of healing; orthodox and complementary medicine alike. Archangel RAphael helps with healing all wounds, past present and future. Archangel Raphael also oversees science and knowledge enabling us to develop a full understanding of our own powers of recovery. 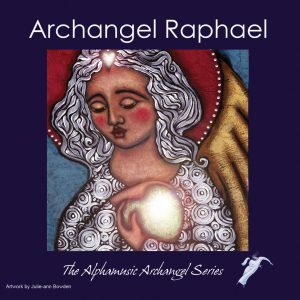 Connect to the universal life force energy of unconditional love and Archangel Raphael will assist you by channelling this energy to facilitate your own and others healing. He is angel of the east and governs the element of air. IAs I relaxed and listened to each of these Archangel CDs I was surprised how clear and strong the message of each Archangel was for individuals and for humanity. The inclusion of indigenous music invites grounding, calms and settles. Another quality this music holds is in its gentle coaxing – it invites one to follow it on a sensitive journey of sound. This is analogous to the practitioner inviting the client to come on a journey of discovering the subtleties within their own body and of consequently healing.